Sign up for a 15-day free trial to watch videos by Maria Leone. Maria Leone, the driving force behind Bodyline, has been teaching Pilates since 1989 and training teachers for well over a decade. She first discovered Pilates at New York University where she holds a Bachelor of Fine Arts degree from the prestigious Tisch School of the Arts. Soon after Maria graduated, her dance career led her to Los Angeles where she danced and choreographed with some of the most respected luminaries in the business including Debbie Allen and Paula Abdul. 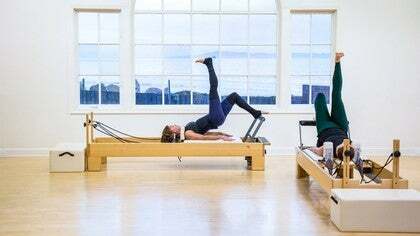 Bodyline was created in 1994 and in 1999 Maria, became the certifying teacher in Los Angeles for the PhysicalMind Institute, which was the first national organization to offer Pilates education. In 2013 Maria became part of the faculty for Balanced Body University, the education branch of Balanced Body, the largest Pilates equipment manufacturer in the United States. Maria considers Pilates a mind-body discipline, and her approach to teaching is very influenced by her love of dance and the martial arts. She holds a black belt in Tae Kwon Do and integrates her mastery of movement into her training sessions. Lauded for her holistic, integrative approach to the Pilates method, Maria is an internationally recognized teacher and spent extensive time in Saudi Arabia rehabbing clientele. She has been the guest teacher at the Golden Door and Cal a Vie and has presented workshops at both the Pilates Method Alliance and Body Mind international conferences. Maria's expertise in rehabilitative training makes her highly sought after by clients with hip replacements, spinal fusions, and other debilitating ailments. Olympic snowboarder Louie Vito came to Bodyline post surgery specifically to strengthen his lower back. Maria enjoys working with a diverse clientele that includes athletes, philanthropists, celebrities, and Octogenarians. She maintains a philosophy that highlights working with clients as individuals and instructs from a platform that emphasizes education in conjunction with dynamic movement. Maria and the DVD series she created, Pilates on the Go, have been featured in Allure, Elle, and Fitness Magazine. In addition to the Huffington Post, she has written numerous articles and workout features for Pilates Style magazine. Maria holds Pilates certifications from the Pilates Method Alliance, Balanced Body, PhysicalMind Institute, and the Pink Ribbon Program. Although recognized as a master trainer in her industry, Maria still considers herself a student and continues to hone her craft.